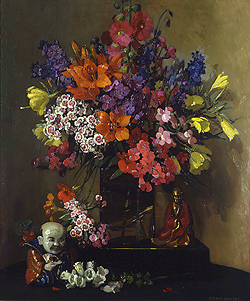 Rarely does an artist with such great talent as Herbert Davis Richter, discover his artistic ability so late in life. Richter, who became well known as a still life painter, spent his young adulthood as the chief designer & architect at the British Bath Cabinet Company, a company his brother es­tablished. Richter was born in Brighton, in the County of Sussex, on May 10 1874. He was the fourth son of Frederick W. Richter. Shortly after he was born the family moved to Bath and he was brought up on a small farm in Lansdown. As a youngster he exhibited mechani­cal and artistic talent and a small workshop was built for him. Richter made an entrepreneurial decision in 1894, when he accepted his brother Charles's invitation to join the British Bath Cabinet Company. 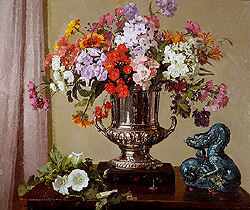 Richter became extremely successful and was recognized by several arts committees for his unique style and excellent workmanship. He received a number of awards as chief designer of the British Bath Cabinet Co., including the Royal Society of Arts Medal in 1897 and Gold and Silver medals at the International Paris Exhibition in 1900. He was also honored by Bath City Schools as key lecturer on architecture and design. Although, Richter's career had been very successful as a designer, his desire to paint overshadowed his desire to attain financial success. As a result, at the age of thirty?two, he enrolled as a student at the Lambeth School of Art, where he remained for a short period of time. He then transferred to the London School of Art, finding the atmosphere to be livelier, inspiring and more progressive. He studied under the two founders of the school John Swann and Sir Frank Brangwyn, each of whom had a profound in­fluence on his life's work. Upon graduation from the London Art School, Richter achieved overnight success as a still?life painter and began exhibiting at all the major British art institutions. 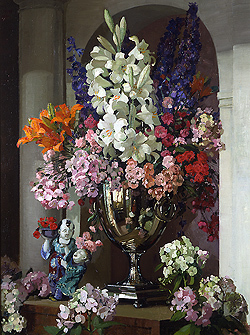 In 1906, he exhibited at and became a member of both the Royal Academy and Royal British Society of Artists. In 1920 he joined the Royal Institute and in 1937 the Royal Watercolour Society. One man exhibitions of his work were held at the Bro ok Street Gallery in 1913, St. George's Gallery in 1923 and the Leicester Gallery in 1925. Richter employs every aspect of the pictoral in his still-lives. He treats all elements of his still life with equal importance, and strives to create a harmonious composition that blends per­fectly into its architectural environ­ment.